NEW ORLEANS – Part one of the weekend preview covered why conferences are so great. I neglected to mention, though, that this weekend contains some of the funniest traditions out there. Two legendary ones are below; if there are any good ones from your conference, email me and we’ll do a conference traditions post. On to the Division III action. 1. Are any conferences better than we think? Five of the top six men’s teams and all six of the top six women’s teams in the coaches’ poll come from different conferences. All but three times in NCAA history (1994, 1995, 2012) has at least once conference put two teams in the men’s and women’s top six, so history tells us that the level of parity painted by the poll is unlikely. 2. Will UW-Eau Claire make history in the WIAC? All season, Eau Claire has been the highest-ranked team in the conference; going into Saturday, they’re ranked No. 2 in Division III. The Blugolds won the Wisconsin state conference in 1980, which I believe is the last year before WIAC XC left the NAIA for the NCAA. Since then, all 33 titles have been won by either UW-La Crosse, UW-Stevens Point, or UW-Oshkosh. Lax has won 20 of those 33 meets, and they’re not exactly itching to let a fourth team into the club. After not being ranked higher than tenth all fall, the Eagles made a major statement at home two weeks ago, beating then-national No. 2 defending national champion St. Olaf. UWL is now ranked No. 5 in the nation. Given La Crosse’s superior dual meet record against Olaf, home course advantage (typically, knowing the course better isn’t much of an advantage, but not travelling is), and three decades of history, they’re a slight favorite, despite the rankings. 3. Will North Central win their 41st straight CCIW title? Kalamazoo men’s tennis has, incredibly, won the MIAA 76 years in a row (though they shared the title in 1962, 2003, and 2013). Ok, here’s a conference with a slightly better tradition. 4. What happens in the NESCAC? First, no matter what happens, T. Bear will be involved. A guy from Williams won a stuffed bear at a fair in 1978 (I think), and we had a good year. MIT stole it the next year, sewed a "T" on the chest, had a good season, and we stole it back. Since then, teams try to steal T-Bear. Once you steal it, you add something new to it. Other NESCAC teams have added a trunk and a tail, though both got ripped off in subsequent attempted heists. Wesleyan had it at one point and called into a radio show and demanded a cow in exchange. We bought a calf and brought it to them in Connecticut. Before that, their women’s team unsuccessfully tried to steal it, and one of them left their phone behind at Williams. We mailed them the phone and a dead fish along with a love letter from T-Bear claiming to have caught it for her. One year at nationals, WashU tried to steal it. We would have gone to St. Louis to try to get it back. Ohio Northern offered us one of their freshmen in exchange for the bear. We called their bluff and nearly met them in Rochester for the exchange. Man, people get really into T. Bear. [Ed. Note: I was not able to nail down whether "T. Bear" or "T-Bear" is the correct nomenclature] We stole it a few years ago and put an elephant trunk on it; when they drove from Williamstown to Medford to get it, they stormed into a freshman’s dorm room and heavily pressured him to reveal where we were keeping it. Even though the No. 3 Middlebury women have ten of the last sixteen conference titles (and ohbytheway, five of the last fourteen national titles), they haven’t had an individual win the ‘CAC since 2000. Alison Maxwell is a slight favorite to break that drought. More importantly, the Panthers must be starting to have national title thoughts. After they beat No. 4 MIT at NEICAAAs, MIT came within ten points of national No. 1 Johns Hopkins at Oshkosh a week later. The drive for a sixth national title this decade would begin by dominating NESCACs at home. Along with Eau Claire vs. La Crosse, No. 3 Williams against No. 7 Colby is one of the best men’s matchups of the weekend. I wrote about Colby after their shocking win at Purple Valley; they’ve barely been heard from since. David Chelimo has raced just once this fall, but it was that big Purple Valley win. Colby hasn’t won a NESCAC team title in 20 years, while Williams has won 13 of the 20 team titles in that span. As always, the No. 4 and 5 runners will be the key. Despite Williams’s excellent performance at Paul Short, they still had a 91 second spread behind Colin Cotton. Chelimo beat Cotton at Purple Valley, and the Mules had a 69 second spread behind him there. If they can replicate that performance, even Williams’s best might not be enough. 5. Will the New England women or Midwest men build a convincing case for seven or eight teams? It’s a brave new world in Division III. Last year was the first with no cap on the number of teams qualifying for nationals out of each region. No region got more than six teams to NCAAs in 2013; this year, four men’s and women’s regions have more than five nationally ranked teams. I am only going to cover the NE women and MW men—because less South/Southeast teams are ranked than will qualify for nationals, I anticipate that S/SE teams will push those other regions down to five teams. Stout, Platteville, Oshkosh need to finish close to each other at WIACs. No. 27 Chicago beats No. 28 NYU and No. 31 Carnegie Mellon at UAAs and then NYU and Carnegie make nationals. Wellesley gets a runner or two inside of MIT’s pack at NEWMACs, and Colby beats No. 21 Amherst at NESCACs. In both regions, places 5-8 get jumbled vis-à-vis the rankings and the points are relatively tight. 6. 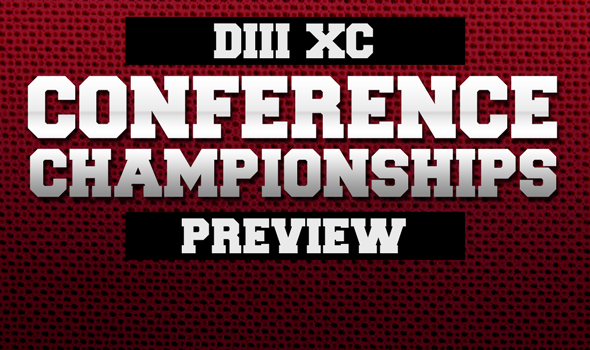 Will Haverford restore order to the Centennial Conference? I originally wasn’t going to write about the Centennial due to my obvious biases (I ran and coached for Dickinson from 2008-13), but if Rojo can write ELEVEN THOUSAND WORDS1 previewing the Ivy League/Heps, I can avoid playing favorites for a few grafs. Before 2008, No. 14 Haverford won every conference meet ever held. No. 18 Dickinson then won in 2008 and 2009, and No. 26 Johns Hopkins won in 2012. Haverford spent much of the season behind their rivals in the regional rankings; while none of three teams have faced each other this fall, the rankings were shuffled after Haverford ran a faster team average in a separate race from Hopkins at Paul Short, followed by an underwhelming Hopkins performance at Oshkosh. While none of three teams have faced each other this fall, the rankings were shuffled after Haverford ran a fast Centennial—will Haverford restore world order? No matter what, it’s going to be a great showdown at Haverford. Two last notes on the Centennial: could Swarthmore (receiving votes in the latest poll) pull the mother of all upsets? One longtime Mideast region coach told me that on the right day, Swat or Widener could win the region. By extension, then, he believes that Swat could break up the hegemony in the Centennial. And there’s nothing Swarthmore students love more than breaking up longstanding male hegemonies. And will Fran Loeb run for Johns Hopkins? She hasn’t raced since finishing as their #1 at the Battle in Beantown. Her return or lack thereof may swing the national title. 7. What about the rest of the country? The MIAC women’s meet is the only one in the nation to feature the top four ranked teams from one region. No. 14 Carleton actually lost to No. 18 St. Olaf at Oshkosh, but were missing several runners now reported to be healthy. No. 22 St. Benedict and No. 24 St. Thomas (Minn) will battle to avoid being the best fourth place team in the country. Whichever men’s team wins the Bridgewater-Washington & Lee battle at ODACs will be well-positioned to grab the second automatic qualifying spot from the South/Southeast. The SCIAC is one of the most unique conferences in the entire NCAA, as place at their Multi-Duals in October factors into the conference championship. While the No. 22 Claremont-Mudd-Scripps men have won four of the last five conference titles, history isn’t as strongly on their side as that stat might indicate. The Stags won the meet by 6 points in 2009, 2012, and 2013. No. 19 Pomona-Pitzer has the buffer of winning Multi-Duals; if the Sage Hens finish second, they clinch at least a share of their first SCIAC win since 2005. As always: follow along at The Wall this weekend.